Here is another uplifting blog from guest blogger Lisa Eliason about managing atrial fib. 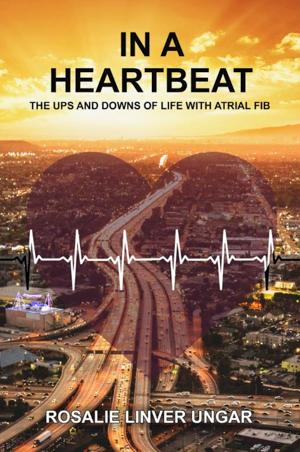 Her ‘take charge’ attitude in managing her health is remarkable & has attracted many readers to these blogs and to my memoir, IN A HEARTBEAT: The Ups and Downs of Life with Atrial Fib. Read what Lisa has to say about sleep apnea. I often think about the old adage of “which came first the chicken or the egg” when I think of my health issues that began to appear in 2012. I first noticed shortness of breath, constant stuffiness and then heart arrhythmia. At night, I would often wake gasping for breath. My family doctor’s only answer was that I must be suffering from anxiety. It was during an attempt at sinus surgery that my heart arrhythmia was recognized. I went to Ross Heart Hospital for treatment that included heart ablation surgery and the insertion of a “loop” heart monitor. I returned to my family doctor. He was not apologetic about missing the diagnosis of heart arrhythmia but did make an effort to determine the cause of my constant stuffiness and nighttime gasps for breath. He ordered a series of allergy tests and a sleep apnea study. The allergy tests revealed nothing and the doctor didn’t test for food allergies. However, from the sleep study, he did determined I had sleep apnea. I went to an ear, nose and throat (ENT) doctor in Columbus for the constant stuffiness and the ENT recommended nasal steroids. Nasal steroids didn’t work. I took matters into my own hands and after research cut out seven highly inflammatory foods from my diet. The stuffiness cleared up. My insurance paid for a C-PAP machine for the sleep apnea. Six years later the C-PAP machine still sits tucked into the back of my closet. I was fifty-six years old at the time. Using the C-PAP machine seemed to me to be a death knell. In my mind, only old people used C-PAP machines. I was still seeing the ENT. I discussed the sleep apnea with him and my reluctance to use the C-PAP machine. He told me to lose ten pounds and wrote a prescription for a mouth device that would fit over my top and bottom teeth, hook together and pull my lower jaw forward to open my airway. Although insurance would pay for a $1,000 C-Pap machine, it would not pay for the mouth device. I took the prescription to my dentist who created the mouth guard and gave me a discount since insurance would not pay. I took the ENT’s advice to heart and actually lost forty pounds. During the whole weight loss journey, I used the mouth guard every night. After the forty pound weight loss, clearer sinuses and the mouth guard, I no longer wake at night gasping for breath. I haven’t had another sleep apnea study. I may or may not still have sleep apnea, but I now wake up rested in the morning when I did not before. So which came first? The sleep apnea or the heart arrhythmia? Did my gasping for breath cause my heart to get out of rhythm? I will never have that answer. I do know that cutting out inflammatory foods and the weight loss made all of the difference in my health. Thanks Lisa. My next week’s blog will continue about successes in managing heart health and how we can take control. This entry was posted in Blog on December 10, 2017 by Mark Layman.